You are here: Home / Featured / What is Blockchain technology ? 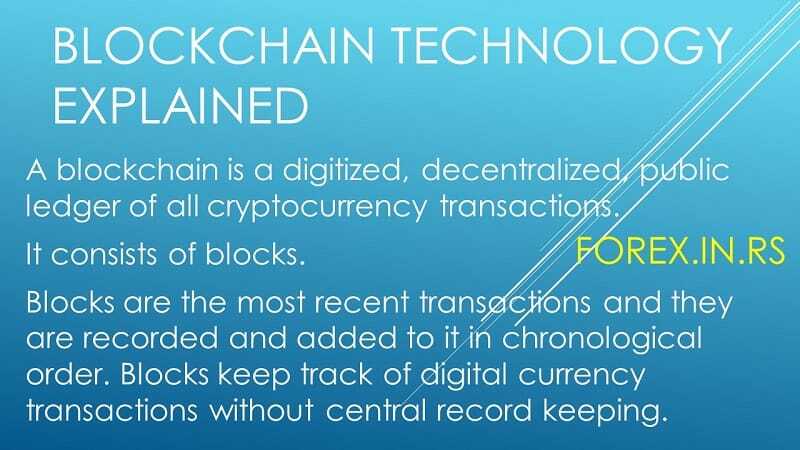 Blockchain technology explained simply: “A blockchain is a digitized, decentralized, public ledger of all cryptocurrency transactions.” It consists of blocks – bitcoin blockchain blocks. Blocks are the most recent transactions and they are recorded and added to it in chronological order.Blocks keep track of digital currency transactions without central record keeping. Blockchain is a new type of internet which allows information to be distributed without being copied. With the continuous evolution of the world through globalization, technology has also not been left behind. It is bringing along ways that are fast enough for people to comprehend systems behind their easier and quicker way of transacting, especially online. Blockchain technology, however, is not a new phenomenon. Surprisingly, its existence dates back to the year 1991. Stuart Haber and his colleague Scott Stornetta explained in theory at first, of how they were to develop a system, whereby the documents would get time-stamped to avoid backdating and tampering. The following year, they were joined by another colleague, which saw them improve on their earlier designs and concepts to enable several documents to be collected and eventually stored in one block. Blocks are typically storage centres of data or information. Various blocks are joined together to create a Blockchain. For the blocks to be tamper proof, each one is secured using the cryptography system. These imply that every block contains a cryptographic hash, which is a unique identifier such as a fingerprint or a specific code. For security and prevention of a possible hacking, no cryptographic hash of any block is similar to the other. The first of the Blockchain technology prominent use was witnessed in 2008 when its usage by Satoshi Nakamoto in cryptocurrency revolutionized his company- Bitcoin. Dealing with digital currency, Bitcoin needed a foul proof public ledger that recorded transactions between parties in a permanently efficient and verifiable way. This revolutionary- Blockchain technology- is open and managed on a peer to peer network for verifiability through internode communication and block validation. Due to its permanence and ability to record events, as well as its impenetrably nature, the technology is viable for use in other areas such as health record management, voting, processing transactions, managing identities and storage of classified documents. This is because once an event is recorded, the ability to delete or alter is barely impossible without interfering with other blocks in the chain attached. Even then, the time required to do so is too much that the system will have detected the breach. Anonymity is where a person’s identity does not get revealed at any given time. This feature is critical since people require privacy, especially in transactions. As for Blockchain technology, every user is allowed an opportunity to interact via a generated address. This is where their real identity is not unmasked, and this reveals one of the Blockchains unique features that has made it popular and enabling its extensive use. On the other hand, lack of a centralized protocol is also another essential component of this technology. When data is in a central location, for example the central or federal reserves, every transaction performed needs authentication and validation by a statutory body such as the central bank. This background check leads to increase in operating costs and subjects the user to many hurdles before approval of payments. This process is tedious, frustrating and takes time to process sometimes extending to days. However, a decentralized system does not require oversight from a third party. Therefore, it is not a requirement for one to report or even inform the authorities when transactions occur. This makes the Blockchain technology fast and reliable in cases where instant or quick exchanges are needed. What’s more, Auditability and persistence are among other reasons why the Blockchain technology is well embraced in cryptocurrency transactions. Due to the multiple nodes verifying information, it is critical to note that data gets verified instantly and reliably in the shortest time possible. This ensures that invalid transactions are immediately discovered and therefore, do not get admitted. Their strict protocol provides that deletion of operations, as well as roll backing them, is impossible, ensuring everything is above board. Various sectors continue embracing the technology due to the various inventions it possesses. For instance, Blockchain technology is developing into a game changer in enhancing healthcare systems. For every healthcare provider, quality service delivery is top of their agenda. Through this technology, it is evident their chances of success are more likely to occur. It is clear that patient care management is directly in line with the achievement of quality care. Various institutions have set up rules and regulations in ensuring that this area is not subject to neglect by health care providers. In this case, Blockchain plays a significant role here in that; it allows alteration of data to get done by community users and various professionals. It is mainly through authentication of the persons. Through the private key cryptography, a digital identity gets created, and the changes added to reflect on the system within seconds. In the medical field, this is crucial as any combined data helps in decision making. The distribution of ledgers is also a revolutionary technique in this industry. The open system guarantees access to experts while serving as a storage facility for data. Additionally, this data is verified, signed digitally and authenticated in real time. The safety of the information is an added assurance that since all members keep a copy of the data, no single user can alter the data. These systems are not entirely new, hence it is easy to transfer and pick up during an introduction. It is also worth noting that the healthcare industry too is a business like any other. Hence, when Blockchain technology enhances transactions in firms, several are healthcare related. Hdac blockchain technology is an IoT contract platform based on blockchain, that not only exchanges but also restricts the usage of connected devices.An IoT contract is a machine-to-machine (M2M) service that controls all the devices in the blockchain network. It is able to do this by embedding a smart contract to the IoT device and sharing the address of the device in the network. Titanium Blockchain is a Blockchain global innovation ecosystem where 80+ developers, architects, Blockchain product managers, business development and investment professionals, made a pioneering Blockchain R&D and consulting company. In the business industry, specifically the financial service providers, insurance companies, asset managers and banks, they are all set to benefit more from Blockchain technology. Access to a whole range of well-interconnected databases and cryptography has continually allowed such institution to gain unlimited access to tamper-proof digital ledgers simultaneously. Earlier the institutions mentioned above ignored this idea, assuming its failure. However, the Blockchain usefulness in the industry led to the consistent growth of these industries venture capital. Areas such as clearing and settlement of trades and loans in financial institutions are set to gain much. Saving of wastages accruing to $10 billion has been projected across the industry on an annual basis when Blockchain is integrated into the system. This proves that the technology is not only efficient, but provides an opportunity for businesses to control leakages that sometimes run them dry financially. The Australian securities exchange, for instance, seeks to migrate all its post-trading operations and settlements on to a Blockchain system. Payments too, especially by central banks in various regions are set to move, and this is due to the realization of the advantages technology brings especially when it comes to fraud prevention and data security. The reluctance by the Switzerland Central Bank to embrace the technology after several calls from local financial players has led to some commercial banks within Switzerland to go it alone to a point where they are raising their own digital currency. Additionally, many central banks across the globe intend to raise digital currencies to curb the growing challenges that Bitcoin possesses on their monetary policies. Moreover, the Blockchain technology can also get used in identifying clients and immigrants, especially in cross-border trades and entries. As it continues to enhance trade, various sectors too are mainly benefiting who include the agriculture industry, music industry and smart appliances, where in particular, users continue enjoying more control over their devices. We can a lot of articles and case studies related to blockchain. For example this technology could help reduce the big internet companies’ influence and return the web to his original vision. Blockchain technology could solve the internet privacy problem, Social Media’s Biggest Problems or Revolutionize the Healthcare Sector, solve whiskey counterfeiting; Ssolve the Water Management Crisis etc. Although Blockchain has been termed a revolutionary in the business and tech world, there are several challenges affecting the effectiveness of this technology. With the growing movement to cryptocurrencies and the continuous growth of Digital Coins, transactions are increasingly becoming bulky. It is, in turn, hindering effective service delivery due to the restrictions on the optimum time to generate a new block. With the speeds of processing transactions set at seven transactions per second per block, it is increasingly becoming a challenge to transact effectively, especially those with low transaction fees. This is because data miners prefer sales generating higher prices as opposed to those with lower fees. Another major demerit is privacy. Blockchain can only preserve a small amount of private information on both the public key and the private key. Recent studies show that since transaction amounts and balances are publicly visible, it is not possible to guarantee ultimate privacy to a user. For instance, in Bitcoin trading and mining, transactions can get linked to reveal user details. This is through classification of buying behaviour and narrowing it down to given specific information such as the user’s age, gender, and area of residence. Therefore, in some cases, the user complete anonymity cannot be guaranteed. Technological advances continue to improve the world in various ways of life. It is important to embrace these technologies as agents of change and simplified ways of doing things. Blockchain technology as witnessed is a promising product, especially in improving businesses and promises to offer a lot in other crucial sectors such as immigration and health care system, especially with medical health management. Central banks in New York, China, and Sweden among others, continue to evaluate the usefulness of this technology in their business models and how they affect their monetary policies. With the enhanced security protocols, its wide range use and reliability will attract many businesses into its adoption. The Blockchain technology is the modern world tech revolution and change to its adoption specifically in the financial sector seems inevitable.